Renting doesn't have to be a barrier to accessing receivables finance for your company. However the number of invoice finance companies requiring clients to be homeowners has increased in recent years. Historically, it was never an issue, but many of the providers have added in this requirement, in order to ensure there is some substance behind personal guarantees that are often required by some providers. 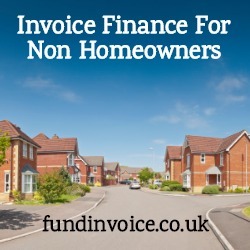 The good news is that we have a growing number of invoice finance companies that are happy to fund where the company directors are tenants in rental accommodation and hence are non homeowners. Receivables financing companies should always be looking towards the book debts of the company as their security, rather than the personal assets of the directors. Different providers take differing stands on this issue. In some cases, they think that taking a personal guarantee will focus the directors on helping the funder to collect out, in the event of a failure. The idea that owning property increases the worth of an individual is not a reliable indicator of means. For example, a person could buy a large house, with a substantial mortgage that they couldn't afford, and be in a worse position than a tenant, in rented accommodation, that has a substantial cash reserve from a previous property sale. Nonetheless, these requirements for property ownership are still common amongst some providers - statistically they believe it puts them in a more secure position. There are also a growing number of providers that don't always require a personal guarantee from their client's directors, in all cases. Some providers seek a "fraud warranty" as an alternative. This means that the provider of the warranty is only liable if they commit a fraud against the funder, rather than being technically liable for any loss incurred by the funder. We are happy to connect clients with funders that will accept tenants in rented accommodation, just call Sean on 03330 113622 for help if you are a non homeowner.